Landform Surveys were commissioned by Northumberland County Council to produce topographic surveys and elevations of over 20 structures and bridges throughout Northumberland. As some of these structures were located over tidal waterways, timings were critical to ensure they were surveyed at low tide. As all of the surveys involved working near water, due consideration had to be given to Health and Safety to ensure the safe working of our teams. 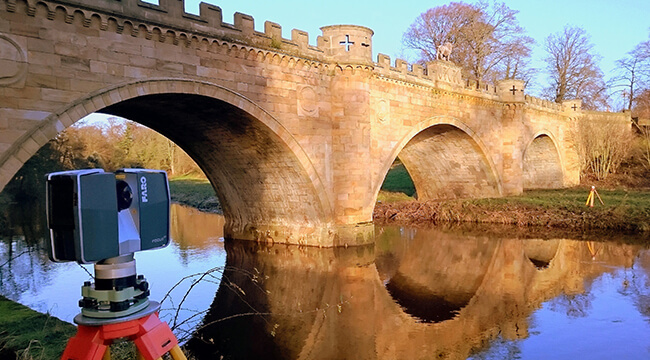 A combination of Trimble S6 Total stations and Faro 3D scanner were used to produce the surveys, which ranged from small culverts in rural locations, to major bridges spanning rivers. The largest structure surveyed was Berwick Old Bridge, which spans the River Tweed and is over 300m long. This was outside the range of our Faro 3D scanner, so we hired a Leica scanner with a range of over 180m to complete the survey. Once complete the final drawings were supplied in AutoCAD .DWG 3D and MX Genio 3D format.